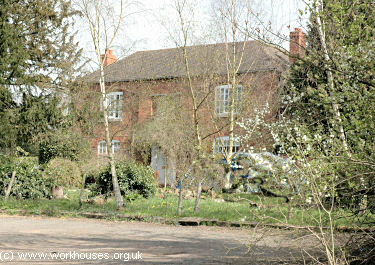 Droitwich's first workhouse was set up on Holloway in 1688 through a bequest of Henry Coventry . However, it proved unsuccessful and was soon converted for use as almshouses which became known as Coventry Hospital, later the Coventry Charity. Droitwich and Dodderhill both had parish workhouses able to house about 30 inmates, while larger ones existed at Ombersley and Claines. Droitwich's parish workhouse stood at the north side of Friar Street, opposite the original St Nicholas' Church near where Hampton Street now meets Saltway. In 1814, Ombersley promoted a parliamentary local Act for "...erecting a new Church, and enlarging the Church Yard; and also, for building a Workhouse for the Poor". The parish erected its workhouse on Hog Lane (now Hill Top Lane) — the building survives as Hill Top House. County of Worcester: Claines (2), Crowle, Dodderhill, Doverdale, Droitwich St Andrew, Droitwich St Nicholas, Droitwich St Peter, Droitwich in Liberties, Elmbridge, Elmley Lovett, Hadsor [Hadzor], Hampton Lovett, Hanbury, Hartlebury (2), Himbleton, Hindlip, Huddington, Martin Hussingtree, Oddingley, Ombersley (2), Salwarpe, Stock and Bradley, Tibberton, Upper Mitton, Upton Warren, Warndon. Later Additions: Crutch (from 1858), Grafton Manor (1837-62), Marlborough in the Vines (from 1858), Paper Mills (from 1858), Shell (from 1858), Westwood Park (from 1858). The population falling within the Union at the 1831 census had been 15,687 — with parishes ranging in size from Doverdale (population 72) to Claines (2,894). The average annual poor-rate expenditure for the period 1834-36 had been £4,595 or 9s.10d. per head. The Droitwich Board of Guardians had their first meeting on 12th October 1836 and formed a workhouse committee to consider the question of workhouse provision for the Union. The committee's report concluded that the existing workhouses at Dodderhill and Droitwich were too small to be of use, but Ombersley and Claines might be enlarged. A preliminary plan was drawn up for the enlargement of Ombersley to accommodate 150 inmates at a cost of about £600. However, it was soon decided that a new workhouse should be built capable of holding 200. 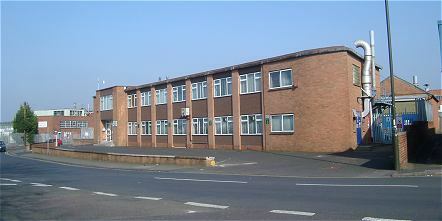 The new building was erected in 1837-8 at a site on what became Union Lane, to the east of Droitwich railway station. It was designed by Sampson Kempthorne who was the architect of many other early Union workhouses including ones at Martley, Pershore, and Upton-upon-Severn. Droitwich workhouse was based on his model "200-pauper" plan, published by the Poor Law Commissioners in 1836, which had a cruciform layout but without a central supervisory hub. The Commissioners authorized an expenditure of £4,000 on construction of the building. Its location and layout are shown of the 1901 map below. The brick building had an entrance block at the north containing a porter's room and the Guardians' board room. To the rear were the children's school and dining room, then the long main accommodation block with male quarters at one side, and female at the other with the kitchens and Master's room at the centre. A dining-hall lay at the centre rear, with blocks of work and utility rooms at the sides. Later additions to the site included an infirmary at the west, a chapel at the west end of the entrance block, and an L-shaped building, possibly a vagrants' block or school, at the east. 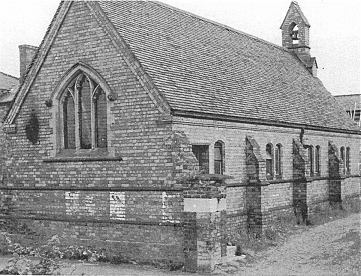 Droitwich workhouse chapel from the north-west, 1950s. 22nd December, 1858. Charlotte Causier of Hill End applied and was instated as schoolmistress of Droitwich Union Workhouse on a three months trial and a salary of £15 per annum, with board and lodging and washing. Some doubt was expressed as to her qualifications, but no-one else had applied. 4th May, 1861. The Medical Officer had allowed the two attendants upon Alfred Causier, who had died from sever scalds, one pint of ale and an extra supper each, daily, during their attendance upon him. 28th May 1862. The Visiting Guardians report made by Mr TB Browne, Inspector of Schools, at his visit on the 15th instant: "The children here are still extremely dull and ignorant, and unable to think and exercise their minds, although some of them as I find, have been a long time in the workhouse. In 1900, the Matron was persuaded to learn to play the harmonium to save the Guardians the cost of employing someone to play at services. For a fee of 30 shillings, Mr Guise agreed to teach her and also to play on Sundays for three months until she was able to take over the duty. In 1903, the Guardians had to pay out large amounts for the repair and re-stocking of the Workhouse. The former Master had allowed the building to get into disrepair and the clothing for the inmates and other items of stock had been reduced to vanishing point. To save on pudding basins and other domestic necessities, the Master even boiled Christmas puddings in bedroom ware and boiled down the lard in bed pans. In 1907, the Guardians received a letter proposing that "beef tea" be removed from the inmates' diet and replaced by meat extract. The letter claimed that beef tea was derived from worn out English horses sent abroad for slaughter and then reimported in the form of a supposedly nourishing drink. The Guardians declined to follow the letter's proposals. According to a 1921 Directory, the workhouse — now know as a Poor Law Institution — could accommodate 205 inmates. The Guardians, under the chairmanship of Major HGH Galton, met on alternate Wednesdays at 11am. After 1930, the site was sold off and used as factory premises. The workhouse buildings no longer exist and an industrial estate occupies the location. Droitwich former workhouse site from the west, 2003. George Green Gabb was Master of the Droitwich Union Workhouse from 14 June 1849 to 1 June 1853. He had previously been made redundant from the post of Inspector of the Railway Works when the Works closed in December 1848. His descendant Martin Gabb has researched the story behind the untimely end to George Gabb's brief career as a workhouse Master (the post could, in principle, be held for life) and produced a fascinating and colourful behind-the-scenes picture of life in the workhouse. The Master of the Workhouse having been by sudden illness incapacitated for the present from performing the duties of his office. A letter from the Poor Law Commissioners bearing date the 13th instant was read wherein they acknowledged the receipt of a letter from the Clerk reporting the illness of Mr Ellins the Master and the appointment of Mr Morgan V W Keen as temporary substitute to perform the duties of the Office. The Clerk having reported that the office of Master had become vacant, since the Board last met, by the death of Mr Henry Ellins which took place on Friday morning last. That advertisement to that effect, at a Salary of £50 a year, together with washing and such provisions as the house affords, be inserted by the Clerk in the Worcester Herald the Worcester Journal the Worcester Chronicle and the Midland Counties Herald newspapers. Weekly meeting of the elected Board of Guardians. Mr Richard Hewitt elected to Office of Master. Salary of £50. A letter from the Poor Law Commissioners bearing date the 10th instant was read wherein for the reasons therein stated they refused to sanction the appointment of Mr R Hewitt to the Office of Master. Mr Thomas Chambers appointed Master of the Union Workhouse. Resolved that Miss Elizth Ellins, sister to the Governess, be, and she is hereby appointed to perform the duties of the Office until her sisters recovery, and that during such time she do live in the house and be provided with such rations as the house affords. It being stated to the Board that the conduct of the Master was frequently very strange and that he sometimes absented himself from the Workhouse at night without any apparent reason and without giving a satisfactory account of himself. On investigation it appeared by the admissions of Mr Chambers the Master, himself, that he had been absent from the Workhouse the whole of the night of the 24th instant wandering about without any object, that he, at times, was subject to affections of the head, and that he had more than once been under restraint for mental derangement. A report is included from the Medical Officer Mr Kitsell. "... to inform you that if as it appears unfortunately be the case the Master of Droitwich Union Workhouse is insane." Resolved that no public advertisement be given of such an election. Only 2 names received for Office of Master - none of which are suitable. 1st That no election of a Master be made this day, but that it is postponed till the Board Meeting on Wednesday the 30th instant at 11 o'clock in the forenoon. 3rd That an advertisement in the usual form but containing in addition the substance of the above resolutions be inserted three several times in the Times Newspaper. It was resolved: That the election of a Master be further postponed to this day fortnight. That in the mean time it appearing (so far as the Board were enabled to judge) from the applications and testimonials of Mr John Benworth Doble and Mr Joseph Lane that they might be suited to fill the Office; that the Clerk do write for further testimonials respecting them. A letter bearing date the 6th instant was received from Mr G Gabb of Droitwich in which he begged to offer himself as a candidate for the Office of Master which he understood was not yet filled up. Ordered that the Clerk do inform Mr Gabb that the election would not take place till next Wednesday and that his application be then laid before the Board. The Board proceeded to the election of a person to fill the Office of Master adjourned from this day fortnight when Mr George Green Gabb was elected unanimously to fill that Office subject to the approval of the Poor Law Commissioners at a salary of £50 per annum, together with such provisions as the house affords and washing, his duties and salary to commence on the 14th instant. Mr Gabb also agreed to give a months notice previous to his resigning the Office or to forgive one months amount of salary to be deducted as liquidated damages from any money due to him at the time of such resignation. George Green Gabb offered the appointment of Master on '6 months trial'. The Guardians are induced to offer this recommendation in consequence of it being stated that Mr Gabb some years was addicted to drinking; in other respects they see nothing to object to if he will continue steady which it is believed he had done for the last 3 or 4 years. A letter from the Poor Law Commissioners bearing date 28 June 1849 was read wherein they sanctioned for the period of 6 months on trial the appointment of Mr George Green Gabb to the Office of Master at a salary after the rate of £50 per annum and rations; and requested that at the expiration of that time the Guardians would make a report as to the manner in which Mr Gabb should have performed the duties of his Office. A letter bearing date the 9th instant was read wherein it was reported that the Guardians of this Union would take precautions against the spread of Cholera in that part of the parish of Claines which was situate in Worcester. The Poor Law Commissioners wrote reference Bonds of Officers. That Mr Gabb the Master of the Workhouse has entered into a Bond with 2 societies for the due performance of the Duties of his Office. It being reported in the Pauper Offence Book by the Master that John Price a male pauper inmate of the Workhouse aged 13 years had been damaging the Property of the Guardians by burning and otherwise injuring the Stockings given him to wear and that the punishment was left to the Board. Expiration of the 6 months trial for the Master. Resolved: That the Visiting Committee be requested to make a special written report to the Board as to their opinion on the subject. The Master having reported in his Journal that Mary Phillips aged 19 had been removed from the Kitchen on the 3rd instant for misconduct and a pauper Harriet Irons aged 19 placed in her stead. The change was approved. I beg most respectfully to inform you that I shall on the 9th of October next resign the situation of Matron which I now hold in this Union, and I trust that the time I have held such situation, upwards of 5 years, has been a credit to myself and to the entire satisfaction of the Board. I beg most respectfully to inform you that I shall on the 9th October next, resign the situation of Schoolmistress to this Union and I trust that the Board will do me the favour to grant such a testimonial as they think my character and conduct deserve. Entry in the Poor Law Commissioners Minutes. Miss Ellins the present School Mistress has this day sent in her resignation of office for 9 Oct next. Mrs Mary Ellins the present Matron has sent in her resignation from 9 Oct next. Cause of Mrs Ellins resignation. "it is caused by a wish on her own back to go and keep house for two of her daughters who have established a school near London." A letter form the Poor Law Commissioner bearing the date 21st instant was read wherein they requested to be informed of the result of the election of Matron as soon as it should be concluded. It being deemed however of great importance by the board that the office of Master and Matron be filled by a man and his wife. Ordered that before advertising for a Matron the clerk do write to the Commissioner and enquire whether the Guardians could call on Mr Gabb the present Master of the Workhouse to resign to enable the Board to elect a man and his wife to those Offices. A letter from the Poor Law Commissioner bearing date the 30th ultimo was read wherein they stated they would not be justified in recommending the Guardians to call upon Mr Gabb to resign the Office of Master and that if he should refuse to comply there would be no legal grounds to support an order for his removal from Office. The clerk having reported that the Office of Matron would become vacant on the 9th instant. The Office of Matron is to be advertised in the Worcester Journal, Herald Chronicle and Midland Counties Herald Newspapers. (Salary £25). Miss Ellins the present School Mistress aged 33 is hereby temporarily appointed to perform the duties of both Matron and School Mistress. The Guardians narrowed the several applicants to two - Miss Dorothy Ellins and Miss Wooldridge and a final vote was taken. Miss Wooldridge, Nurse, Union House Stourbridge appointed Matron. Resignation of Miss Wooldridge as the Matron. The Commissioner asked for a reason and was told that Miss Wooldridge was "uncomfortable in the situation". George Green Gabb married Dorothy Ellins 21 December 1850, St Andrew, Droitwich. Mrs Dorothy Gabb the wife of the Master be appointed to the Office of Matron at a salary of £25 per annum. The Master having in his Journal reported the Porter for misconduct and altogether defying his authority. The case was investigated by the Board, when it appearing that the Porter had not treated the Master with the due respect and submission in performance of his duties, the Porter was cautioned against insolence to the Master in future. The Baker William Harris preferred a charge against the Master of having returned home in a state of intoxication last Wednesday fortnight and getting over the Hospital rails. It was resolved: That the Master be cautioned by the Chairman as to his future behaviour. A letter from Mr George Green Gabb the Master of the Union Workhouse was read wherein he solicited the Board for a testimonial as to the manner in which himself and the Matron had conducted the establishment since their appointment to their respective offices. Resolved: That the following testimonial be given to Mr Gabb and the Chairman was directed to sign it. Mr and Mrs Gabb the present Master and Matron of his Workhouse have applied to this Board for a testimonial as candidates for a similar situation in the Bedford Union. Mr George Green Gabb has filled the Office of master for 3 years his wife acting as matron since her marriage nearly two years ago. The Workhouse has been well regulated during the period of Mr Gabb's superintendence; he has kept his books with uniform care and correctness, his wife has held the situation of matron to the entire satisfaction of the Board. A letter from Revd John Topham Chaplain to the Union House bearing date the 9th instant was read. I take the liberty of informing the Board of Guardians that the conduct of the Schoolmistress has recently been brought under my notice in a most unfavourable light, and I respectfully request that the Guardians would examine the nurse upon the subject before they separate this morning - and should it appear that there is a probability that the Schoolmistress may not be able to resume her duties in the school, to allow one the privilege to appoint a person (pro tempore) to manage the school i.e. until a successor may be elected. In accordance with the recommendation of the Chaplain, Mary Howell the nurse was sent for, and from her statements it appearing that the Schoolmistress illness was the result of a miscarriage she had recently had, and the fact having been admitted by her to the Chaplain who with the sanction of the Boards questions her on the point. Resolved: That Miss Emuss be and she is hereby suspended from the performance of her duties as Schoolmistress. I received your letter this morning to which you wish an immediate answer. In reply I beg to state I shall feel thankful if you will kindly allow me until after Wednesday next, not that I can clear myself from the suspicion that at present rests upon me but must rely upon your goodness and mercy awaiting until after next Board day, when I will furnish you with a full explanation of the very serious and most grievous affair. Miss Emuss the Schoolmistress being now sufficiently recovered to appear before the Board and it being reported that she alleged Mr Gabb the Governor of the Workhouse to have been the father of the child with which she had miscarried. Mr Gabb was informed of Miss Emuss's statement, the truth of which he denied and also that he had ever had any improper connection with Miss Emuss. A letter from Mr George Green Gabb the Master of the Union Workhouse bearing date the 19th instant was read wherein he expressed the intention of himself and Mrs Gabb to tender their resignation of their respective Offices of Master and Matron at the Droitwich Union Workhouse and further stated that such tender would be placed in the hands of the Clerk to be presented at the Board immediately on the decisions of the Poor Law Board in reference to the charge of improper conduct lately brought against the Master should be received. Resolved: That the Clerk do acknowledge the receipt of Mr Gabb's letter but that the Board do not enter into the consideration thereof, the Masters conduct being now under the consideration of the Poor Law Board. A letter from Mr and Mrs Gabb the Master and Matron of the Workhouse bearing date the 2nd instant was read whereby they resigned the respective Offices of Master and Matron from the 2nd day of June next or at such earlier period as the Board would release them from. Ordered that the Clerk do respect such resignation to the Poor Law Board and at the same time request their early decision respecting the charge lately brought against the Master by the late Schoolmistress. I am directed by the Poor Law Board to inform you that they have received the Report of their Inspector Mr Graves upon the enquiry recently held by him unto the charge preferred by Miss Emuss the late Schoolmistress against Mr G G Gabb the Master of the Workhouse together with solemnous evidence produced in support of and in opposition to the charge. It appears that Miss Emuss has left the Workhouse and the service of the Guardians and that the Master has also resigned his Office under them and has obtained other employment unconnected as the Board infer from his letter with the administration of the Poor Laws. The Board entirely approves of the course adopted by the Guardians as regards acceptance of the resignations of Miss Emuss and Mr Gabb and as both have by their respective resignations ceased to be any longer officially connected with this Department or with the Guardians of the Droitwich Union, the Board trust that the Guardians will concur with them in considering it unnecessary to advert further to the recent investigations at which such conflicting evidence was adduced, as to render it extremely difficult for either the Guardians or this Board to arrive at any positive or satisfactory conclusion. Mr and Mrs Layton appointed Master and Matron. Officers in 1921: James H Richards (Master), Mrs Gertrude Richards (Matron), Rev. Edwin Lewis (Chaplain), Percy Austin Roden (Medical Officer). Worcestershire Archive and Archaeology Service, The Hive, Sawmill Walk, The Butts, Worcester, WR1 3PB. Very few records survive — holdings include: Guardians' minute books (1836-1922); Ledgers (1836-1921); etc. Appreciation is due to Martin Gabb for allowing the inclusion of his work on George Green Gabb.